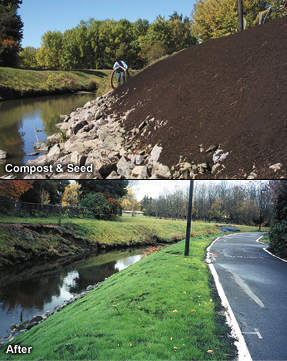 Inaccessible areas, such as steep embankments, can be covered with mulch, compost, or soil mixes for immediate erosion control. Grass seed or special seed mixes can be injected into the material during application using our patented seed injection system, providing for long-term vegetative control. One combined process replaces many, saving time, labor and money.  To watch the video click the "watch the video" button on the left. A new pop up window containing the video clip will appear. Click on the movie to play.  You must have the latest QuickTime 4 plug-in installed on your brower to view these video clips. If you do not have the plug-in, you can download it here.